Russell and Brown's is ran by Amy Russell & Carl Brown. This dynamic duo have led the way in bringing creativity, style and technique back into hair ups and dressing long hair as well as creative cuts and colour. Their philosophy is to take modern styling techniques and combine them with classic and traditional hair techniques to create head turning hair. Whether you're after a slice of Old Hollywood Glamour, something more bohemian and beautiful or an on trend style, they are able to create the hair of your dreams with a twist of Russell and Brown's signature flair. As a pair, Amy & Carl have developed the Russell & Brown's brand over a number of years. Starting out as freelance stylists, they travelled the country styling for bridal clients and at their own pop up salons across the UK. Having developed a loyal client base online, they finally established their first stand alone salon in the leafy suburb of Sefton Park in Liverpool in 2017. "From the China cups to swinging tunes it's a real experience having your hair done by Amy and Carl and they make you feel so welcome and you'll leave looking and feeling like a million dollars." At the Russell and Brown's Salon, Amy & Carl create exceptional level hair. They pride themselves on their welcoming and friendly approach to clients. The salon itself has been described as a hidden gem, from the swinging tunes to the china tea cups, it's a cosy place to relax, feel glam and leave looking a million dollars. It is one of Liverpool's premium hair salons offering classic cuts and colours as well as the signature Russell and Brown's hair ups & Hollywood Waves. However, that's not all that Russell and Brown's has to offer. The team also run their bespoke bridal styling service across the UK. Offering personalised and polished bridal hair and make up is one of Amy and Carl's favourite things to do - for more information on their wedding hair and make up packages, click here. Amy & Carl also now dedicate a lot of their time to sharing their skills with fellow stylists and hair enthusiasts around the world through their comprehensive long hair education classes. You can find out all about these exciting events here. Working with major hair brands including, Revlon Professional, GHD & L'Oreal; the pair have a wealth of experience to bring to the table. 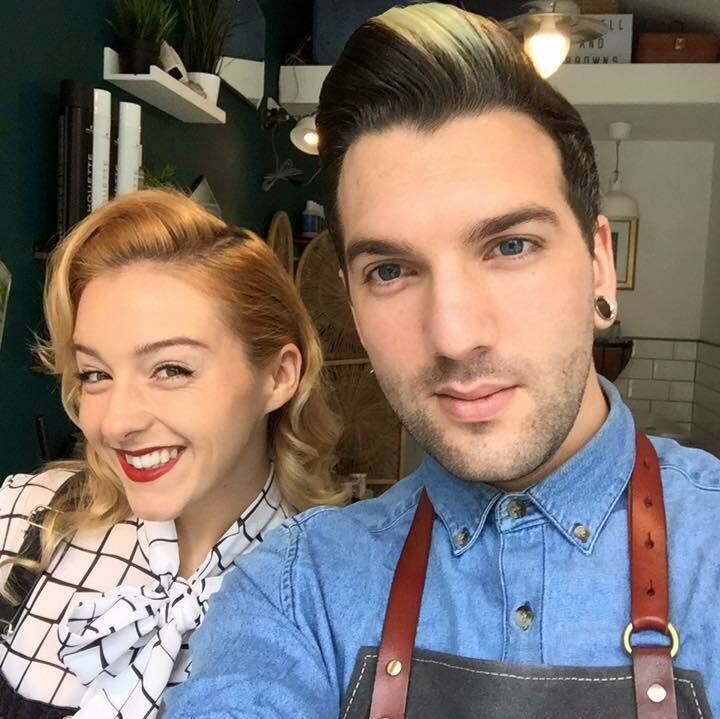 They have been regulars at London & Paris Fashion Week meaning they are able to share with you the latest tips, tricks and techniques to take your hair styling to the next level whilst still keeping to their vintage roots.